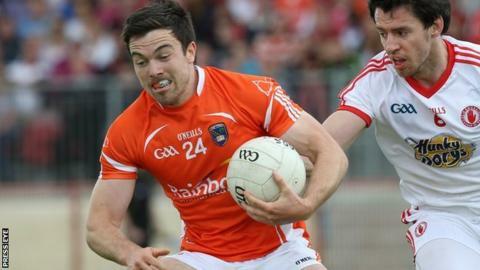 Armagh lost 1-10 to 0-8 to Meath and had Aidan Forker sent-off late on for a second yellow card offence in their opening Division Two fixture on Sunday. With the aid of a strong breeze, Armagh enjoyed a slender one-point lead at half-time, 0-8 to 1-4, despite Michael Newman's ninth-minute goal for Meath. The visitors failed to register a score after the break and had Miceal McKenna black-carded after Forker's dismissal. Sean Tobin (3), Newman (2) and Donal Keogan were Meath second-half scorers. Armagh made several changes to their starting line-up prior to throw-in as Stephen Sheridan, Ethan Rafferty and Colm Watters came in for Aaron Findon, Niall Grimley and Eugene McVerry. Stefan Campbell (2), Gavin McParland (2), McKenna (2) Rafferty and Stefan Forker pointed for the Orchard county in the first half, but Rafferty was off-target with an effort at goal. The hosts made full use of their wind advantage after the break and ran out comfortable victors. Armagh host Laois at the Athletic Grounds next weekend.